The administration has set some new rules and regulation for Chadder Trek for the safety of tourists and protection of environment. (Note that Wildlife permit will only be given after presentation of medical certificate from SNM Hospital). 	Travel companies operating Chaddar trek have to be registered with the Tourism department. 	Certificate of Registration from Tourism Department will be given after checking the availability of essential trekking and safety equipments which also includes green disposal bags. 	List of porters hired along with the certificate of experience and trainings, to be part of the registration process and identity cards to be issued to each porter by Wildlife Department. 	Detailed information of the tourists to be maintained including blood group and address of next of kin by the tour operators. 	It will be mandatory to play the audio advisory issued by Tourism Department in their taxi for the benefit of tourists. 	Garbage bag provided by LAHDC is to be kept in the vehicle at all times and to be deposited the garbage at waste segregation centre at Solar Colony. 	Cleanliness drives to be organised by Wildlife Department with mandatory and active participation by all the travel companies before the start of the Chaddar trek season and after the season is over. 	Oxygen cylinder to be kept in the taxi at all times. 	The Wildlife department shall regulate by allowing not more than 100 tourists per day. 	Permit to be issued only to tourists organized by recognized travel Companies on the production of medical certificate issued by SNM Hospital Leh. 	To maintain a register for garbage returned after each tour. 	To install & maintain toilets on the route of the trek. 	To install & maintain garbage collection bins. 	To prepare the checklist for registration of tour operators specially for Chaddar trek. This checklist should be circulated immediately to Wildlife Department and tour operators so that they can prepare accordingly for the next season. 	To circulate the audio advisory in the interest of safety of tourists, to all taxi operators. 	To procure and circulate garbage bags to all taxi operators and other tourist vehicles. 	To provide support at Wildlife check post at Chiling and creation of a new check post near Sangam for the period of Chadcjar trek. 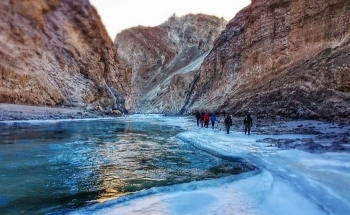 	Explore the Possibility of Providing communication network along the route of the trek. 	District Administration to explore the Possibility of enhancing the medical arrangements at Chiling and Neraks. 	District administration to provide green bags to the tour operators who will ensure that each group going on the Chaddar trek will collect its garbage in these green bags and return it to the Wildlife Department after the trek. If any provision of these regulations is contravened by any tourist, travel company or taxi operator, they shall be guilty of an offence and shall be liable to a fine between ₹ 5,000 - 10,000 in the first instance. Parties repeatedly in non-compliance shall be liable to a fine between ₹10,000 and ₹ 50,000. The administration reserves the right to revoke the licence of the tour operator, if the regulations are violated.